​​​Tabitha works to build wells and ponds to provide water for drinking, bathing and washing, as well as for animals and to irrigate crops. Unfortunately, during the Pol Pot years, most wells were destroyed. 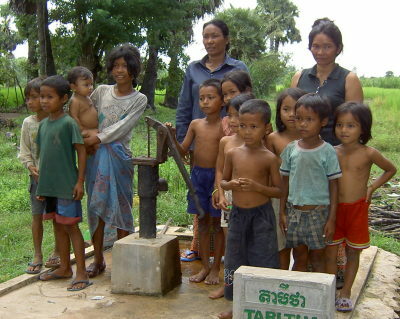 Tabitha is currently providing 200-300 new water sources per month throughout Cambodia and wishes to increase this number as much as possible. The Water program runs in parallel with the “Community Development through Savings” program. This program enables families to have access to clean, potable water and to raise a family’s income significantly. Before a family receives a source of water they must be in the savings program. Without a distinct change in attitude and the development of a dream, wells will not impact a family’s development. There are two primary uses for the water supply - clean drinking water and irrigation. In the absence of safe wells, drinking water is sometimes taken from open ponds or rivers which are commonly polluted with excreta or chemicals. Villagers (and most importantly children) often develop dysentery, and other infectious diseases. The average distance to walk to a safe water source is 3 kilometers. This means that several members of the family are required to wake at 4am in the morning, walk to the water source and then wait their turn for water – usually 3 to 4 hours. This precludes a number of children from attending school. Since a person is only able to carry several containers of water at a time, it means that family members often develop skin rashes, their hair becomes stiff and dull and eyes are infected with dirt related causes because of their inability to wash on a daily basis. Without a sustainable source of clean water near their homes, families are restricted in their ability to increase their incomes. Animal husbandry or growing crops year round is impossible without an ongoing source of water available. Crops (mainly rice) are grown during the wet season. However, because rainfall tends to be erratic, wet season crops may fail because of inadequate sources of water – wells provide that water. During the long dry season no crops will grow unless a reliable source of water is secured. Wells and ponds provide that security. Families with wells or ponds grow “6-week" vegetables, including morning glory, peas, beans, lettuce, tomatoes, etc. throughout the dry season as well as summer rice. Animal husbandry, the raising of pig, chickens, ducks are an integral part of income generation from wells. Their productive growth seasons expand from 6 months to an average of 11 months per year thereby tripling a family’s consumable income as well as providing food security.